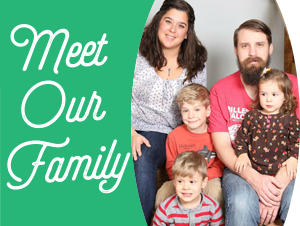 Before I had children, I worked at a Montessori school with children ages 2 ½ to 6. I loved it and was thoroughly convinced I wanted my own children taught by the same method. When my son was born, I got my Infant/Toddler diploma from NAMC and began doing Montessori activities with Joey (around 6-7 months). I quickly realized how programmed I’d become to the 3-6 age range that I struggled to think of activities for my baby. Environment is key. Children live in an adult world, so it’s important to prepare the environment to meet the child’s needs as well as lead them toward independence. Look for sturdy, child-size furniture along with toys made of preferably of natural materials, provide structure through routine, and make the items they use on a daily basis accessible. Take a tour of your home at your child’s level, you might be surprised how inaccessible your home is to a child! Sensory Experiences. Young children learn first through touch. They have to hold, feel, taste, or smell something to begin to understand it. Let your kids hold sticks, rocks, leaves. Give them bowls of flour, corn starch, and sugar…let them feel the difference. Try a pot with a wooden spoon, plastic spatula, and egg beater for testing out sounds or a basket full of different types of fabric. Slow down. As adults, we’re used to getting a lot done in a short amount of time. We call it efficiency. But when our children are involved, we need to slow down. Take a walk just for the sake of exploring. If your child is able to walk, allow your child to walk along side you instead of in a cart. Perhaps give them their own list with pictures or ask them to look for certain items. Paint and draw without seeing it as scribbles and a waste of paper. Dip your fingers in the paint and feel its coolness along with your child. Take the time to bend low and look at life through the eyes of your child. Let them work alongside you. If you’re cooking, doing laundry, putting away groceries, or other family activities involve your children as much as you can (and as is safe). Children learn by observation and doing. Allow them to ask questions and be willing to answer! And if you don’t know an answer? Go searching for it together. But more important than teaching Junior how to switch the laundry is giving him a sense of belonging and contribution to the family by allowing him/her to work alongside you. By allowing your child to work along with you you’re not only teaching them the in’s and out’s of work and learning how to care for their environment, but you are giving them an opportunity to see themselves as capable. Respect the child. Montessori put a great emphasis on respecting the child and I think for good reason. Often we hurry the child along, expect them to meet our pace, neglect their need for work (or play), and minimize their emotions and contribution to family life because they are little. They may be infants, toddlers, or preschoolers, but they are still people independent of ourselves in the process of becoming. Explore. Allow the child ample time (and access) to explore the environment around him/her in and out of doors. Exploring looks different in various environments and ages. It may mean letting your 7-month-old push their fingers through the carpet, surprise themselves at the sound their hand makes on a wooden table, or sift through a treasure basket. For an older child, exploring may be a new activity like working with play dough, taking books on and off the shelf (even adult books) to flip through the pages, or meandering in a field picking up sticks and looking for bugs. It’s important to let them discover. 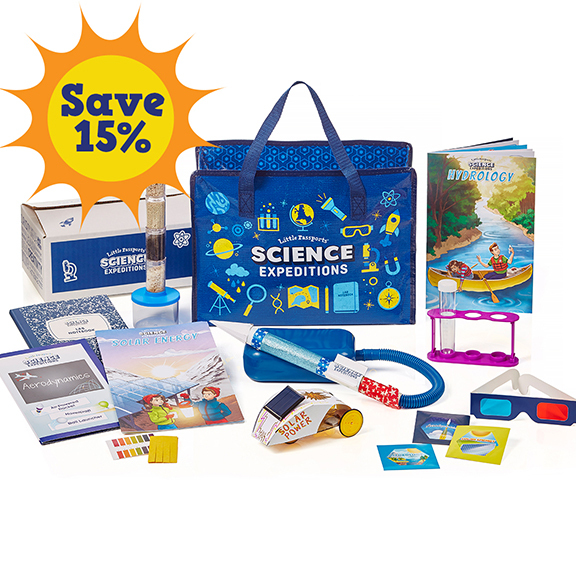 The act of discovery causes children to not only notice the world around them, but to think on what they encounter and cultivates a desire to learn and explore more. At the heart of the Montessori philosophy is a desire to learn and explore, but not for the sake of acquiring information and going to the next level. 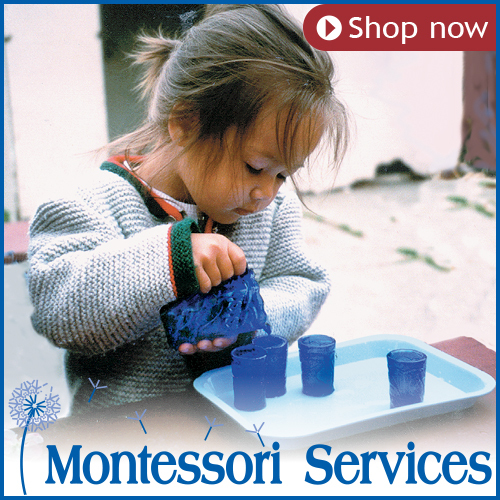 In the Montessori method we lead, learn, and explore for the joy of discovery. Lay down the spirit of Montessori, this joy of discovery, before formal instruction. It will carry you farther and you’ll join your children in your own process of becoming. Looking for more advice on starting Montessori at home? 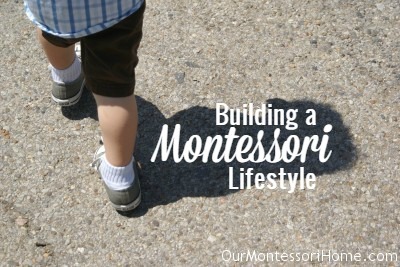 Check out my post Starting Montessori at Home to help you get going. The domain of the linked website has expired so the article is no longer readable. I know it’s an older article for you, but I’d really like to read it. Could you post it here?